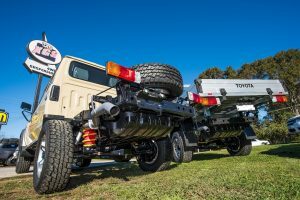 TJM Hunter Valley are your local fleet vehicle specialists. We have a specialised fleet team dedicated to providing your site specific requirements, now matter how large or small your fleet. We offer a huge range of products from mine-spec light bars and electricals, storage solutions, ute trays, ROPS, vehicle protection, suspension – wheel and tyre upgrades, signage, right through to full site-specific vehicle fit-outs. Check out our extensive range of fleet products below and if there’s something we don’t stock – we’ll get it for you. 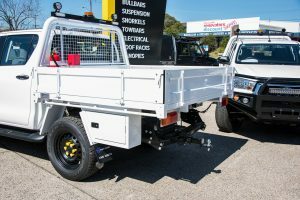 So whether it’s a 2 vehicle fleet, a 50 vehicle fleet or you’re a stand-alone tradie looking to get up to spec with your contract requirements – we have a solution to meet your needs. 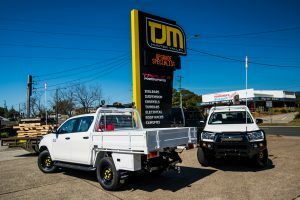 TJM has a full range of vehicle protection products to suit most makes and models of 4WD and many 2WD vehicles as well, including fleet and premium style bull bars, heavy duty side steps and side protection bars, rear protection bars and roll-over protection systems (ROPS). 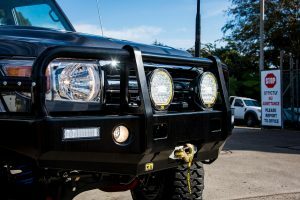 Most of our bull bars are winch compatible and many come with built in rated recovery points, hi-lift jack points and are all fully ADR, airbag and sensor compatible – and they won’t affect your vehicle’s ANCAP safety rating. 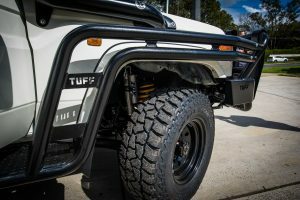 We are also suppliers of the entire Tuff Bull Bar range including their legendary 5 Post bull bars. 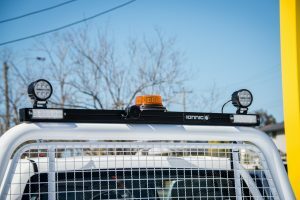 We can supply and fit mine bars, work lights, dual battery systems and driving lights, customisable to suit your site requirements. Using the latest in LED technology, fully customisable switch panels and qualified staff – we can come up with a solution to suit your needs. We have access to well-known, reliable brands such as Ionnic, Narva and Britax, so we have a solution for your needs. 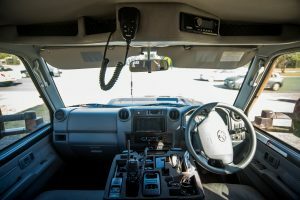 We stock a large range of 5W UHF fixed radios as well as a variety of hand held radios and portable units for transferring from vehicle to vehicle. We can also arrange for fit-outs of commercial radios if you have a more specific site need. We stock brands including GME, Uniden and Oricom and have an application to suit every purpose. Whether you’re working in a harsh mining environment and need the toughest products money can buy or you’re just after a budget option to minimise costs – we have a tray or canopy option to suit your needs. We can fit and supply trays in bulk quantities to cover large fleet deals and fit them out with roll over protection systems including brands such as Fleet Trades, Norweld, Tip Top, Bronco and Truckfit. 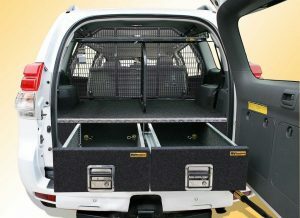 We have a wide variety of storage solutions for utes and vans including single and twin draw systems, right through to full van fit-outs to organise and maximise the storage capacity of your vehicles which will drive your dollar further. We have a variety of suppliers to choose the right storage solutions to suit your needs including RV Storage Solutions, MSA and Outback Accessories. Carrying heavy loads, toolboxes and tools? You could be overloading your standard suspension and potentially illegally overloading your vehicle. We have a suspension solution to suit your needs. Whether it’s a basic upgrade to improve your vehicle’s handling or a fully engineer approved and certified GVM upgrade – we have what you need. We are preferred suppliers of Lovells GVM Upgrades and also have access to many suspension suppliers including our own TJM XJS and Pace suspension. We also specialise in rear coil spring conversions to suit the popular 70 Series Landcruiser. 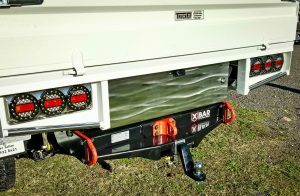 We have a range of towing accessories including tow bars, weight distribution hitches, tow braking units, break away monitors and general towing parts and accessories. We stock brands such as Haymen Reese tow bars, TJM towbars, Redarc brake units and Redarc break away monitors. 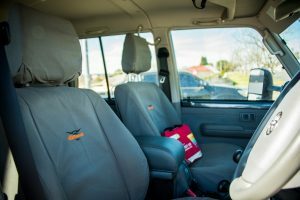 When you are working in dirty, dusty and muddy conditions, the first sign of ware and tear will appear on your vehicle’ seat covers. Prolonging the life of your vehicle’s seats can improve resale value and save you money on costly seat damage repair bills. We have a large range of canvas and neoprene seat covers to suit any application including brands such as Black Duck, MSA and Inland Australia’s Tuff Seat and Wet Seat covers. We also can supply fitted and universal floor mats and luggage mats to suit a wide range of vehicles. Working of night time has an increased safety risk and one of the best ways to reduce that risk is by fitting a set of driving lights or work lights to your work vehicles. We stock a huge range of driving and work lights including the latest in LED and HID technology from well known brands such as Narva, Lightforce, Stedi and X Ray Vision. If your fleet is involved in mining operations, construction or anything off-road, the standard tyres aren’t really going to cut it, especially when you’re loaded up or the weather turns bad. A good set of tyres, and/or wheels will dramatically improve the handling and safety of your vehicle in these conditions and you’ll suffer less tyre damage which can ultimately save your business money in the long time. We have an extensive range of steel and alloy wheels that carry a higher load rating than your vehicle’s standard offerings and tyres that range from 20% off-road use right through to tyres that are designed to perform in the muddiest of conditions. We stock the best brands in the business including BF Goodrich, Mickey Thompson tyres and Dynamic Wheels. 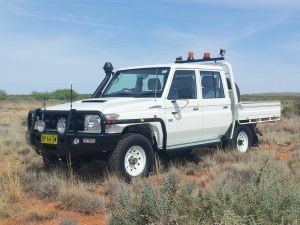 If you’re operating your fleet in dusty or wet conditions, a snorkel can prolong the service life of your vehicle by raising the air intake up out of the dust line, feeding the engine cooler, cleaner air. This will keep the air filter cleaner for longer, which means the engine will also perform its best between services and return better fuel economy – ultimately reducing your overheads. 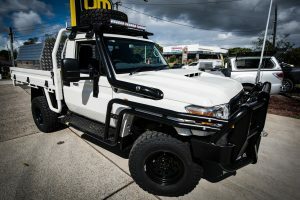 We can fit and supply the TJM Airtec snorkel for most makes and models including OE replacement snorkels for the popular 70 series Landcruiser which has an inefficient 2-piece design. We can also fit stainless steel replacement snorkels for the 70 series Landcruiser. 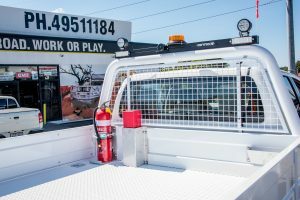 We look after all the little things when it comes to building a fleet that’s right for your businesses needs including fire extinguishers, mining flags, wheel chocks, call signs, hi-vis signage, wheel nut indicators and a whole lot more.